The Fiat 500 Abarth Tenebra concept car drew much attention from the attending media at the 2013 Detroit Auto Show. We posted a sneak peek of the car in a previous story (click here), and now here are the pictures everyone wants to see. The car is a real head turner in person. Hard to tell from the images, but the matte finish features heavy metalflake so as to add depth to the paint, making it more than just the usual matte paint job. Just barely visible in these images are the gloss grey Abarth side striping. The name "Tenebra" in Italian translates to "darkness" in English. 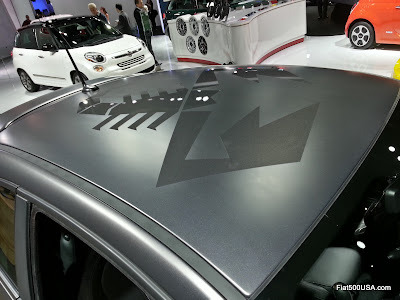 You can't go wrong with a huge Abarth logo on the roof of a car! The Fiat 500 Abarth Tenebra features unique 16 inch, hyper-black chrome alloys that look stunning. Detail shot of the 500 Abarth Tenebra wheels. Interior of the 500 Abarth has been revised with grey piping and stitching replacing the normal red on the leather seats, steering wheel, shift boot and instrument cluster brow. Matte-black carbon fiber dashboard panel was borrowed from the Abarth 695 Maserati and is made by Magneti Marelli. Heavy metal flake in the matte grey paint finish is striking in person. Blacked out headlights, running and taillights make the car look sinister. All the trim on the 500 Abarth Tenebra has an elegant black-chrome effect. Features of the Fiat 500 Abarth Tenebra. In the next post, we'll take a look at the Fiat 500T Cattiva concept car. Stick around! New Fiat 500 by Gucci II Trim Package Debuts! Fiat 500 Abarth Tenebra Sneak Peek! Fiat 500 Abarth Special Edition to be Revealed! Fiat 500c Abarth Cabrio Pricing Announced!